The economy of Russia is the ninth largest economy in the world by nominal value and the sixth largest by purchasing power parity (PPP). Russia has an abundance of natural gas, oil, coal, and precious metals. Russia has undergone significant changes since the collapse of the Soviet Union, moving from a centrally planned economy to a more market-based and globally integrated economy. Economic reforms in the 1990s privatized most industry, with notable exceptions in the energy and defense-related sectors. Nonetheless, the rapid privatization process, including a much criticized “loans-for-shares” scheme that turned over major state-owned firms to politically connected “oligarchs”, has left equity ownership highly concentrated. As of 2011, Russia’s capital, Moscow, now has the highest billionaire population of any city in the world. In late 2008 and early 2009, Russia experienced the first recession after 10 years of rising economy, until the stable growth resumed in late 2009 and 2010. Despite the deep but brief recession, the economy has not been as seriously affected by the global financial crisis compared to much of Europe, largely because of the integration of short-term macroeconomic policies that helped the economy survive. Last year (2011) Russia’s gross domestic product grew by 4.2 percent, the world’s third highest growth rate among leading economies. The government expects it to grow 3.7 percent this year. “Following 4.2 percent growth in 2011, we think the slowdown will lead to GDP growth of about 3.5 percent for the full year,” S&P Chief Economist for Europe Jean-Michel Six said in a statement. The Russian economy underwent tremendous stress as it moved from a centrally planned economy to a free market system. Difficulties in implementing fiscal reforms aimed at raising government revenues and a dependence on short-term borrowing to finance budget deficits led to a serious financial crisis in 1998. Lower prices for Russia’s major export earners (oil and minerals) and a loss of investor confidence due to the Asian financial crisis exacerbated financial problems. The result was a rapid decline in the value of the ruble, flight of foreign investment, delayed payments on sovereign and private debts, a breakdown of commercial transactions through the banking system, and the threat of runaway inflation. Russia, however, appears to have weathered the crisis relatively well. As of 2009 real GDP increased by the highest percentage since the fall of the Soviet Union at 8.1%, the ruble remains stable, inflation has been moderate, and investment began to increase again. In 2007 the World Bank declared that the Russian economy had achieved “unprecedented macroeconomic stability”. Russia is making progress in meeting its foreign debts obligations. 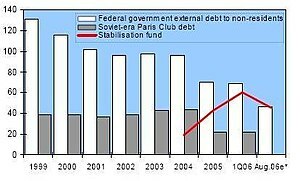 During 2000–01, Russia not only met its external debt services but also made large advance repayments of principal on IMF loans but also built up Central Bank reserves with government budget, trade, and current account surpluses. The FY 2002 Russian Government budget assumes payment of roughly $14 billion in official debt service payments falling due. Large current account surpluses have brought a rapid appreciation of the ruble over the past several years. This has meant that Russia has given back much of the terms-of-trade advantage that it gained when the ruble fell by 60% during the debt crisis. Oil and gas dominate Russian exports, so Russia remains highly dependent upon the price of energy. Loan and deposit rates at or below the inflation rate inhibit the growth of the banking system and make the allocation of capital and risk much less efficient than it would be otherwise. Inflation remained a problem however, as the government failed to contain the growth of prices. Between 1999–2007 inflation was kept at the forecast ceiling only twice, and in 2007 the inflation exceeded that of 2006, continuing an upward trend at the beginning of 2008. The Russian economy is still commodity-driven despite its growth. Payments from the fuel and energy sector in the form of customs duties and taxes accounted for nearly half of the federal budget’s revenues. The large majority of Russia’s exports are made up by raw materials and fertilizers, although exports as a whole accounted for only 8.7% of the GDP in 2007, compared to 20% in 2000.